For the article on the causes of the war themselves, see Causes of World War I. Historians writing about the origins of World War I have differed over the relative emphasis they place upon the factors involved. Changes in historical arguments over time are in part related to the delayed availability of classified historical archives. The deepest distinction among historians remains between those who focus on the actions of Germany and Austria-Hungary as key and those who focus on a wider group of actors. Those historians such as Fritz Fischer who believe that Germany deliberately planned a European war, once a widespread view, are now in a small minority. The main distinction is now between those who believe that a war between the "Great Powers" was ultimately unplanned but still caused principally by Germany and Austria-Hungary taking risks, and those who believe that either all or some of the other powers, namely Russia, France, Serbia and Great Britain, played a more significant role in risking war than had been traditionally suggested. Given the catastrophic consequences of the war, and its far-reaching social, political and economic implications, the origins of the war, and in particular who "caused" the war, remain heated questions. Louis P. Bénézet's map of "Europe As It Should Be" (1918), depicting nations based on ethnic and linguistic criteria. Bénézet's book The World War and What was Behind It (1918) blamed on German aggression combined with perceived threats to the traditional social order from radicals and ethnic nationalists. Straight after the war Allied historians argued that Germany was solely responsible for the start of the war: a view reinforced by the inclusion of 'war guilt' clauses within the Treaty of Versailles. In 1919, the German diplomat and former Chancellor Bernhard von Bülow went through the German archives to suppress any documents that might show that Germany was responsible for the war and to ensure that only documents that were exculpatory (favorable to the defendant, in this case, Germany) might be seen by historians. As a result of Bülow's efforts, between 1923–27 the German Foreign Ministry published forty volumes of documents, which as the German-Canadian historian Holger Herwig noted were carefully edited to promote the idea that the war was not the fault of one nation but were rather the result of the breakdown of international relations. Certain documents such as some of the papers of the Chancellor Theobald von Bethmann Hollweg which did not support this interpretation were destroyed. The few German historians in the 1920s such as Hermann Kantorowicz who argued that Germany was responsible for the war, found that the Foreign Ministry went out of its way to stop their work from being published and tried to have him fired from his post at Kiel University. After 1933, Kantorowicz who as a Jewish German would have been banned from publishing, was forced to leave Germany for his "unpatriotic" writings. With the exceptions of the work of scholars such as Kantorowicz, Herwig has concluded that the majority of the work published on the subject of World War I's origins in Germany prior to Fritz Fischer's book Griff nach der Weltmacht was little more than a pseudo-historical "sham". Academic work in the English-speaking world in the later 1920s and 1930s, blamed the participants more or less equally. In the early 1920s, several American historians opposed to the terms of the Treaty of Versailles such as Sidney Bradshaw Fay, Tyler Barchek, Charles A. Beard and Harry Elmer Barnes produced works that claimed that Germany was not responsible for war. Article 231 of the Treaty of Versailles, which had seemingly assigned all responsibility for the war to Germany and thus justified the Allied claim to reparations, was invalid. A feature of American "revisionist" historians of the 1920s was a tendency to treat Germany as a victim of the war and the Allies as the aggressors. The objective of Fay and Barnes was to put an end to reparations imposed on Germany, by attempting to prove what they regarded as the moral invalidity of Article 231. The exiled Wilhelm praised Barnes upon meeting him in 1926. According to Barnes, Wilhelm "was happy to know that I did not blame him for starting the war in 1914. He disagreed with my view that Russia and France were chiefly responsible. He held that the villains of 1914 were the international Jews and Free Masons who, he alleged, desired to destroy national states and the Christian religion." The German Foreign Ministry lavished special "care" upon the efforts of both Fay and Barnes with generous use of the German archives, and in the case of Barnes, research funds provided by the German government. The German government liked Fay's The Origin of the War so much that it purchased hundreds of copies in various languages to hand out for free at German embassies and consulates. The German government allowed books that were pro-German in their interpretation, such as Barnes's The Genesis of the World War, to be translated into German while books such as Bernadotte Schmitt's The Coming of War 1914 that were critical of German actions in 1914, were not permitted to be published in Germany. (5) According to the memoirs of the French Ambassador at St. Petersburg, M. Paléologue, published in 1921 in the Revue des Deux Mondes, the Grand Duchesses Anastasia and Militza told him, on July 22, 1914, at Tsarskoe Selo, that their father, the King of Montenegro, had informed them in a cipher telegram, "we shall have war before the end of the month [that is, before the 13th of August, Russian style] ... nothing will be left of Austria. ... You will take Alsace-Lorraine. ... Our armies will meet at Berlin. ... Germany will be annihilated." In a different approach, Lenin in his pamphlet Imperialism: the Highest Stage of Capitalism portrayed the war as imperialist, caused by rivalries triggered by highly organised financial monopolies, that by frenzied competition for markets and raw materials, had inevitably brought about the war. Evidence of secret deals between the Tsar and British and French governments to split the spoils of war was released by the Soviets in 1917–18. In the 1920s and 1930s, more socialist works built on this theme, a line of analysis which is still to be found, although vigorously disputed on the grounds that wars occurred before the capitalist era. Lenin argued that the private ownership of the means of production, in the hands of a limited number of capitalist monopolies, would inevitably lead to war. He identified railways as a 'summation' of the basic capitalist industries, coal, iron and steel and that their uneven development summed up capitalist development. "Not Germany, but England, France and Russia prepared for war soon after the death of Bismarck. But Germany has also guilt to bear. She could have prevented the world war on three fronts, if she had not waited so long. The opportunity presented itself often—against England in the Boer War, against Russia when she was engaged against Japan... That she did not do so is Germany's guilt, though a proof that she was peaceful and wanted no war." In the inter-war period, various factors such as the network of secret alliances, emphasis on speed of offence, rigid military planning, Darwinian ideas and a lack of resolution mechanisms were blamed by many historians. These ideas have maintained some currency since then. Famous proponents include Joachim Remak and Paul Kennedy. At the same time, many one-sided works were produced by politicians and other participants, often trying to exculpate themselves. In Germany these tended to deflect blame, while in Allied countries they tended to blame Germany or Austria-Hungary. In 1961, the German historian Fritz Fischer published the controversial Griff nach der Weltmacht, in which Fischer argued that the German government had an expansionist foreign policy, formulated in the aftermath of Social Democratic gains in the election of 1912 and had started a war of aggression in 1914. Fischer was the first historian to have full access to the entire remaining German World War I archives. Previous historians had only been able to access heavily edited archives that had been created in order to support the view that war was the inevitable product of the breakdown of international diplomacy, rather than the end result of German expansionist ambitions. He was the first to draw attention to the War Council held by the Kaiser Wilhelm II and the top military-naval leadership of the Reich on December 8, 1912, in which it was declared that Germany would start a war of aggression in the summer of 1914. The Kaiser and the Army leadership wanted to start a war at once in December 1912, but heeded objections from Grand Admiral Alfred von Tirpitz, who supported the idea of starting a war but argued that the German Navy needed more time to prepare and asked that the war be put off until the summer of 1914. The Kaiser agreed to Tirpitz's request. In 1973, the British historian John Röhl noted that in view of what Fischer had uncovered, especially the War Council meeting of December 8, 1912, that the idea that Germany bore the main responsibility for the war was no longer denied by the vast majority of historians, although Fischer later denied claiming that the war was decided upon at that meeting. Annika Mombauer in contrast to Röhl observed in her work on Helmuth von Moltke that despite a great deal of research and debate "there is no direct evidence to prove that military decision-makers understood December 1912 as a decisive moment at which a future war had been agreed upon". Fischer's discovery of Imperial German government documents prepared after the war began, calling for the ethnic cleansing of Russian Poland and German colonization to provide Germany with Lebensraum (living space) as a war aim, has also led to the widespread acceptance by historians of continuity between the foreign policies of Germany in 1914 and 1939. Fischer alleged the German government hoped to use external expansion and aggression to check internal dissent and democratization. Some of his work is based on Theobald von Bethmann-Hollweg's Septemberprogramm which laid out Germany's war aims. Controversially, Fischer asserted a version of the Sonderweg thesis that drew a connection between aggression in 1914 and 1939. Fischer was later to call Bethmann-Hollweg the "Hitler of 1914". Fischer prompted the Primat der Innenpolitik ("primacy of domestic politics") school, emphasizing domestic German political factors. Some prominent scholars in this school include Imanuel Geiss, Hans-Ulrich Wehler, Wolfgang Mommsen and Volker Berghahn. In a major 2011 conference entitled "the Fischer Controversy 50 Years On", a group of historians and academics debated the legacy of Fischer's work. The conclusion was that "...a consensus emerged that Fischer had got it right in attributing 'a significant part of the historical responsibility for the outbreak of a general war' to Germany and that Fischer's thesis of the continuity of German war aims still stands fifty years later." Yet by August 2014, many new books had appeared which by their divergent views collectively continue the controversy. The "Berlin War Party" thesis and variants of it, blaming domestic German political factors, became something of an orthodoxy in the years after publication. Nonetheless many authors have attacked it. German conservative historians such as Gerhard Ritter asserted that the thesis was dishonest and inaccurate. Ritter promoted the idea that Germany displayed the same traits as other countries and could not be singled out. In a 1962 essay, Ritter contended that Germany's principal goal in 1914 was to maintain Austria-Hungary as a great power, and thus German foreign policy was largely defensive as opposed to Fischer's claim that it was mostly aggressive. Ritter claimed that Fischer attached unwarranted significance to the highly bellicose advice about waging a "preventive war" in the Balkans offered in July 1914 to the Chief of Cabinet of the Austro-Hungarian foreign ministry, Count Alexander Hoyos, by the German journalist Viktor Naumann. Ritter charged that Naumann was speaking as a private individual and not as Fischer claimed on behalf of the German government. Ritter felt that Fischer had been dishonest in his portrayal of Austro-German relations in July 1914. Ritter charged that it was not true that Germany had pressured a reluctant Austria-Hungary into attacking Serbia. Ritter argued that the main impetus for war within Austria-Hungary was internal, and though there were divisions of opinion about the course to pursue in Vienna and Budapest, it was not German pressure that led to war being chosen. In Ritter's opinion, the most Germany can be criticized for in July 1914 was a mistaken evaluation of the state of European power politics. Ritter claimed that the German government had underrated the state of military readiness in Russia and France, falsely assumed that British foreign policy was more pacific than what it really was, overrated the sense of moral outrage caused by the assassination of Archduke Franz Ferdinand on European opinion, and above all, overestimated the military power and political common sense of Austria-Hungary. Ritter felt that in retrospect it was not necessary from the German point of view to maintain Austria-Hungary as a great power but claimed that at the time most Germans regarded the Dual Monarchy as a "brother empire" and viewed the prospect of the Balkans being in the Russian sphere of influence as an unacceptable threat. Ritter argued that though the Germans supported the idea of an Austrian-Hungarian invasion of Serbia, this was more of an ad hoc response to the crisis gripping Europe as opposed to Fischer's claim that Germany was deliberately setting off a war of aggression. Ritter complained that Fischer relied too much on the memories of Austro-Hungarian leaders such as the Count István Tisza and Count Ottokar Czernin who sought to shift all of the responsibility for the war on German shoulders. Ritter ended his essay by writing he felt profound "sadness" over the prospect that the next generation of Germans would not be as nationalistically-minded as previous generations as a result of reading Fischer. "I am alarmed and dismayed by your letter of 21 March. If Bethmann, as you write, in July 1914 had the 'desire' [Wunsch] to bring about war with Russia, then either he played without conscience with the fate of the German people, or he had simply incredible illusions about our military capablilities. In any case, Fischer would then be completely in the right when he denies that Bethmann seriously wanted to avoid war...If what in your view, Riezler's diary reveals is correct, I would have to discard my article, instead of publishing it...In any case we are dealing here with a most ominous [unheimlichen] state secret, and all historical perspectives are displaced [verschieben sich], since...Bethmann Hollweg's September Program then appears in a wholly different light". It is certainly not true, however, that the views of the Fischer school have come to be almost universally shared, either inside Germany or out. The older interpretations of people like Pierre Renouvin, Bernadotte Schmitt, and Luigi Albertini--which, while quite critical of Germany, never went so far as to claim that the German government deliberately set out to provoke a general war--are still very widely accepted. In the 1960s two theories emerged to explain the causes of World War I. One championed by the West German historian Andreas Hillgruber argued that in 1914, a "calculated risk" on the part of Berlin had gone awry. Hillgruber argued that what the Imperial German government had attempted to do in 1914 was to break the informal Triple Entente of Russia, France and Britain by encouraging Austria-Hungary to invade Serbia and thus provoke a crisis in an area that would concern only St. Petersburg. Hillgruber argued that the Germans hoped that both Paris and London would decide the crisis in the Balkans did not concern them and that lack of Anglo-French support would lead the Russians to reach an understanding with Germany. Hillgruber argued that when the Austrian attack on Serbia caused Russia to mobilize instead of backing down, the German Chancellor Theobald von Bethmann-Hollweg under strong pressure from a hawkish General Staff led by General Moltke the Younger panicked and ordered the Schlieffen Plan to be activated, thus leading to a German attack on France. In Hillgruber’s opinion the German government had pursued a high-risk diplomatic strategy of provoking a war in the Balkans that had inadvertently caused a world war. Another theory was A. J. P. Taylor's "Railway Thesis" in his 1969 book War by Timetable. In Taylor's opinion, none of the great powers wanted a war but all of the great powers wished to increase their power relative to the others. Taylor argued that by engaging in an arms race and having the general staffs develop elaborate railway timetables for mobilization, the continental powers hoped to develop a deterrent that would lead to other powers seeing the risk of war as too dangerous. When the crisis began in the summer of 1914, the need to mobilize faster than potential opponents made the leaders of 1914 prisoners of their logistics. The railway timetables forced invasion (of Belgium from Germany) as an unavoidable physical and logistical consequence of German mobilization. Taylor argued that the mobilization that was meant to serve as a threat and deterrent to war instead relentlessly caused a world war by forcing invasion. Other authors, such as the American Marxist historian Arno J. Mayer in 1967, agreed with some aspects of the "Berlin War Party" theory but felt that what Fischer said applied to all European states. In a 1967 essay "The Primacy of Domestic Politics", Mayer made a Primat der Innenpolitik ("primacy of domestic politics") argument for the war's origins. Mayer rejected the traditional Primat der Außenpolitik ("primacy of foreign politics") argument of diplomatic history, because it failed to take into account that all of the major European countries were in a "revolutionary situation" in 1914. In Mayer's opinion, in 1914 Britain was on the verge of civil war and massive industrial unrest, Italy had been rocked by the Red Week of June 1914, France and Germany were faced with ever-increasing political strife, Russia was facing a huge strike wave, and Austria-Hungary was confronted with rising ethnic and class tensions. Mayer insists that liberalism was disintegrating in face of the challenge from the extreme right and left in Britain, France and Italy, while being a non-existent force in Germany, Austria-Hungary and Russia. Mayer ended his essay by arguing that World War I should be best understood as a pre-emptive "counterrevolutionary" strike by ruling elites in Europe to preserve their power. In a 1972 essay "World War I As a Galloping Gertie", the American historian Paul W. Schroeder blamed Britain for the First World War. Schroeder argued that the war was a "Galloping Gertie", that it got out of control, sucking the Great Powers into an unwanted war. 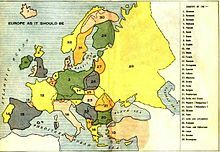 Schroeder thought that the key to the European situation was what he claimed was Britain's "encirclement" policy directed at Austria-Hungary. Schroeder argued that British foreign policy was anti-German and even more anti-Austrian. Schroeder argued that because Britain never took Austria-Hungary seriously, it was British policy to always force concessions on the Dual Monarchy with no regard to the balance of power in Central Europe. Schroeder claimed that 1914 was a "preventive war" forced on Germany to maintain Austria as a power, which was faced with a crippling British "encirclement policy" aimed at the break-up of that state. The American historian Samuel R. Williamson, Jr., lays most of the blame with the Austro-Hungarian elites rather than the Germans in his 1990 book, Austria-Hungary and the Origins of the First World War. Another recent work is Niall Ferguson's The Pity of War which rejects the Fischer thesis, laying most of the blame on diplomatic bumbling from the British. Ferguson echoes Hillgruber in asserting that the German government attempted to use the crisis to split the Entente. American historian David Fromkin has blamed elements in the military leadership of Germany and Austria-Hungary in his 2004 book Europe's Last Summer. Fromkin's thesis is that there were two war plans; a first formulated by Austria-Hungary and the German Chancellor to start a war with Serbia to reinvigorate a fading Austro-Hungarian Empire; the second secret plan was that of the German military leadership to provoke a wider war with France and Russia. He thought that the German military leadership, in the midst of a European arms race, believed that they would be unable to further expand the German army without extending the officer corps beyond the traditional Prussian aristocracy. Rather than allowing that to happen, they manipulated Austria-Hungary into starting a war with Serbia in the expectation that Russia would intervene, giving Germany a pretext to launch what was in essence a preventive war. Part of his thesis is that the German military leadership were convinced that by 1916–18, Germany would be too weak to win a war with France, England and Russia. Notably, Fromkin suggests that part of the war plan was the exclusion of Kaiser Wilhelm II from knowledge of the events, because the Kaiser was regarded by the German General Staff as inclined to resolve crises short of war. Fromkin also argues that in all countries but particularly Germany and Austria documents were widely destroyed or forged to distort the origins of the war. Christopher Clark's 2013 book The Sleepwalkers: How Europe Went to War in 1914 refocused the origins back to the Balkans and sought to redistribute agency back to the diplomats. He also sought to distribute responsibility to all of the Great Powers, paying particular attention to Germany, Austria-Hungary, France and Russia. Clark argues that the Germanic powers sought a localised war to punish Serbia, but in doing so knowingly risked war with Russia. For its part Russia accepted the risk of war by upsetting the balance of power in the Balkans in 1912-13, encouraging anti-Austrian irredentism, and deciding to support Serbia come what may. France did not restrain Russia, positively encouraging her to face down the Germans and support Serbia in 1914. Clark concludes that while all the continental powers risked a general war, none sought that war. The book challenges the imputation, hitherto widely accepted by mainstream scholars since 1919, of a peculiar "war guilt" attaching to the German Empire, instead mapping carefully the complex mechanism of events and misjudgements that led to war. There was, in 1914, nothing inevitable about it. Risks inherent in the strategies pursued by the various governments involved had been taken before without catastrophic consequences: this now enabled leaders to follow similar approaches while not adequately evaluating or recognising those risks. Among international experts many saw this presentation by Clark of his research and insights as groundbreaking. In Germany itself, where the book received much critical attention, reactions were not all positive. Volker Ullrich contended that Clark's analysis largely disregards the pressure for war coming from Germany's powerful military establishment. According to Hans-Ulrich Wehler, Clark had diligently researched the sources covering the war's causes from the German side only to "eliminate [many of them] with bewildering one-sidedness" ("verblüffend einseitig eliminiert"). Warming to his theme, Wehler attributed the sales success of the book in Germany to a "deep seated need [on the part of German readers], no longer so constrained by the taboos characteristic of the later twentieth century, to free themselves from the burdensome allegations of national war guilt"
Russia accepted the four power conference proposal but Austria-Hungary rejected the proposal. Germany also rejected the proposal on the grounds that they believed only Germany would support their ally. Bogdanor believes the Germans were mistaken. “That’s mistaken. I think Grey would have taken the Austrian side and would have said concessions were needed by Serbia to keep the peace…and it would have been very difficult for the Russians not to go along with that." The Russians further proposed that the conflict be subject to the court of arbitration in the Hague but this too was rejected by Germany and Austria-Hungary. To Bogdanor the rejection of the options of the four power conference and the court of arbitration weigh heavily against Germany and Austria-Hungary when looking for the causes of the war. Regarding historians inside Germany, she adds that by the 1990s, "There was 'a far-reaching consensus about the special responsibility of the German Reich' in the writings of leading historians, though they differed in how they weighted Germany’s role. ^ Hans Wilhelm Gatzke (1980). Germany and the United States, a "special Relationship?". Harvard UP. p. 52. ^ Donald R. Kelley (2006). Frontiers of History: Historical Inquiry in the Twentieth Century. Yale UP. p. 90. ^ a b c d e f g h i j Herwig, Holger. "Patriotic Self-Censorship in Germany", pages 153–159, from The Outbreak of World War I, edited by Holger Herwig. Boston: Houghton Mifflin, 1997. ^ Fischer, Fritz, "Twenty-Five Years Later: Looking Back on the "Fischer Controversy" and Its Consequences", pages 207-223, from Central European History, Volume 21, Issue 3, 1988, page 214. ^ a b c d e f g h i j k l Ritter, Gerhard, "Anti-Fischer", pages 135–142 from The Outbreak of World War I edited by Holger Herwig. Boston: Houghton Mifflin, 1997. ^ Fischer, Fritz "Twenty-Five Years Later: Looking Back on the "Fischer Controversy" and Its Consequences" pages 207-223 from Central European History, Volume 21, Issue 3, 1988 page 210. ^ Marc Trachtenberg (1991). History and Strategy. Princeton University Press. p. 50. ^ Hillgruber, Andreas Germany and the Two World Wars, Cambridge: Harvard University Press, 1981 pages 26 & 30–31. ^ a b c d Mayer, Arno, "The Primacy of Domestic Politics", pages 42-47 from The Outbreak of World I, edited by Holger Herwig. Boston: Houghton Mifflin, 1997. ^ a b c d e Schroder, Paul, "World War I As a Galloping Gertie", pages 142-151 from The Outbreak of World War I edited by Holger Herwig. Boston: Houghton Mifflin, 1997. ^ Christopher Clark's ″The Sleepwalkers: How Europe Went to War in 1914 (2013), p. 525. ^ Berthold Seewald (25 October 2013). ""Besessen von der deutschen Kriegsschuld" Mit seinen neuen Thesen zum Kriegsausbruch 1914 provoziert der britische Historiker Christopher Clark heftige Debatten. In Potsdam stellte er sich seinen Kritikern – mit erstaunlichem Ergebnis.Die Selbstzerstörung Europas.". Die Welt (online). Retrieved 15 December 2014. ^ Andreas Kilb (9 September 2013). "Die Selbstzerstörung Europas: Christopher Clark hat eine Studie über den Ausbruch des Ersten Weltkriegs verfasst: "Die Schlafwandler" ist das Buch des Jahres. Und eine Mahnung an alle, die militärische Konflikte regional begrenzen wollen". Frankfurter Allgemeine Zeitung (online). Retrieved 15 December 2014. ^ Richard J. Evans, Rezension zu: Christopher Clark, The Sleepwalkers. How Europe Went to War in 1914, London 2013. In: The New York Review of Books, 6 February 2014, pages 14–17. ^ Volker Ullrich: Zündschnur am Pulverfass. In Die Zeit, 17 September 2013; Volker Ullrich: Nun schlittern sie wieder. In Die Zeit, 16 January 2014. see also: Annika Mombauer: Julikrise und Kriegsschuld – Thesen und Stand der Forschung. In: Aus Politik und Zeitgeschichte 64 (2014), H. 16/17, pages 10–17. ^ Christopher Clark's ″The Sleepwalkers: How Europe Went to War in 1914 (2013), p. 559. ^ a b Britain and 1914 - Professor Vernon Bogdanor 46mins, YouTube. Hewitson, Mark. Germany and the causes of the First World War (Bloomsbury Publishing, 2014). Keiger, J. F. V. (2013). (online review by Patrick Finney) "The Fischer Controversy, the War Origins Debate and France: A Non-History" Check |url= value (help). Journal of Contemporary History. 48 (2): 363–375. doi:10.1177/0022009412472715. Lebow, Richard Ned. "Lessons of World War I." in Lebow, ed., Avoiding War, Making Peace (Palgrave Macmillan, Cham, 2018). pp 95-127. Martel, Gordon. Origins of the First World War (Taylor & Francis, 2016). Mombauer, Annika (2002). The Origins of the First World War: Controversies and Consensus. London: Routledge. ISBN 978-0-582-41872-1. Mombauer, Annika. "Guilt or Responsibility? The Hundred-Year Debate on the Origins of World War I." Central European History 48#4 (2015): 541-564. Mombauer, Annika. "The German centenary of the First World War." War & Society 36.4 (2017): 276-288. Mulligan, William: The Historiography of the Origins of the First World War , in: 1914-1918-online. International Encyclopedia of the First World War. This page was last edited on 13 November 2018, at 04:09 (UTC).